Address: 3351 South Sand Hollow Road – enter at Main Ticket Booth – turn right towards the beach area. Staging will be past the restaurant/ATV rentals, on the right hand side near the restrooms. Park below paved parking area (it will be full of vendors) and walk up to the trailer on the far side of restrooms – look for banner and Maxxis tents (not trailers). There will be signs. **IMPORTANT** you MUST have printed your Confirmed Entry Form for admission in to the park to avoid paying $10/car to get in to Sand Hollow State Park. You can register at the park, if you have not registered online, this will require a State Parks Pass or payment of entry at the gate in addition to your registration fee for the run. Registration opens at 7:15 a.m. Come prepared to stretch. First flight will go at 7:45 a.m., other flights will follow quickly. Both the 5K and 10K follow the same beginning and ending loop – the 10K goes out farther from base. Course will be well marked with water stations throughout. This is a low-key event, no stress on times, we want to have fun, enjoy the scenery and each other’s company. The courses are laid out along the waterfront. Most of the course is medium to hard packed sand, there are a few areas of soft sand. More soft sand in the 10K loop than in the 5K. The course will not be good for strollers unless they have wide tires. Any questions, let us know. Shelley at 208-220-2135. Course maps below, not much elevation change and the scenery is beautiful. New Event coming in October! 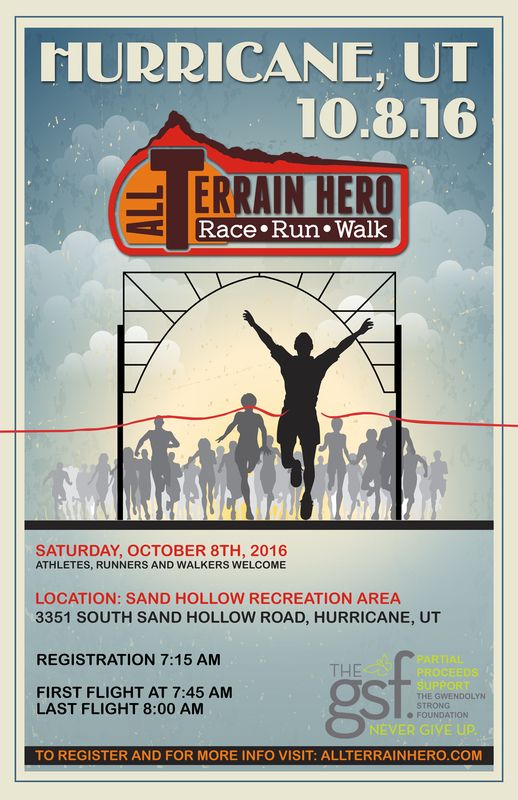 We are part of the Trail Hero event at Sand Hollow State Park in Hurricane, Utah. We have a 5k or a 10k course for you to race.run.walk on October 8th. If you want to race against others, no problem, the course is unique, challenging and covers varied terrain. It is tough enough for elite athletes. How fast can you run it? If you want to take an easier pace and just see if you can finish it, we’ve got a spot for you in the second flight; run the trails at your pace and enjoy the scenery; we’ll show you your time, but you will only be competing against yourself. If you want to walk the course, perhaps bring the kids, that is no problem at all; the trails have varied terrain, but no one is pushing you. Take all the time you need to walk the terrain. All of you are welcome to join us, part of the fun is that we are raising money for The Gwendolyn Strong Foundation with your help, we run for those who can’t. Fun will be had by all. Sign up now to participate – t-shirts, race bibs and other gear available to all. Prices range from $40 for racers to $29 for children. Registration includes a tshirt; a race bib and entrance to the state park, if pre-registered. Preregistration is open until the night before the event – be sure you print your entry ticket, this will gain you entrance to the Sand Hollow State Park as your Racer Pass. If you register onsite, you will have to pay the additional $10 to enter the park. Can’t make the event live? Join us virtually – check out this page for more info.